The extended Huygens-Fresnel principle is used to formulate general expressions of the mutual intensity function for a finite optical source with partial spatial coherence propagating in the weakly turbulent atmosphere. Formulations are developed for both the focused and collimated Gaussian beam. Generalized criterion for the effective far-field range is defined in terms of the source aperture, optical wave number, source coherence, and characteristic length associated with the atmospheric turbulence. 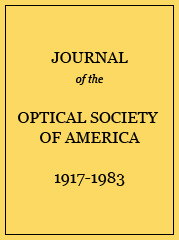 Beam spread and lateral coherence length in the near and far field are investigated for a combination of parameter variations and the physical implications discussed. Finally, analytic results are calculated and plotted to illustrate the functional behavior of relevant physical parameters.